I hope that 2014 brings with it a new series of adventures in life for you. I know it will for me. I have decided to continue working in Papua New Guinea and so I’ll be bringing you more Postcards from Dangerous Places throughout the coming months. 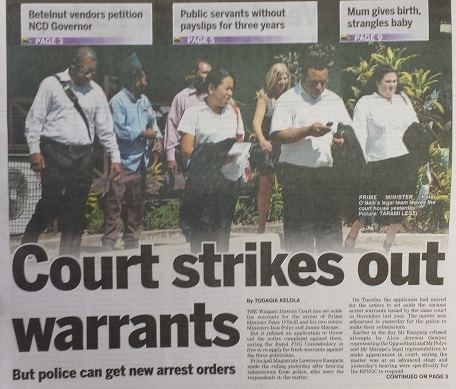 I returned to Port Moresby a week ago and what a week it has been. I came in as the sun was rising and quickly observed the first change to the city during my absence. 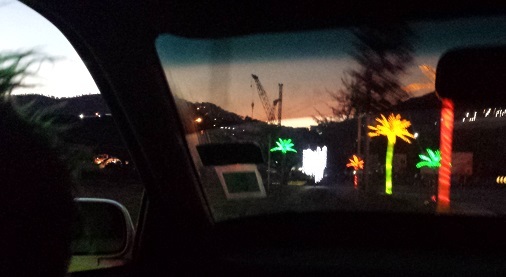 Someone has erected large fake palm trees covered in Christmas lights. It’s hard to say why. 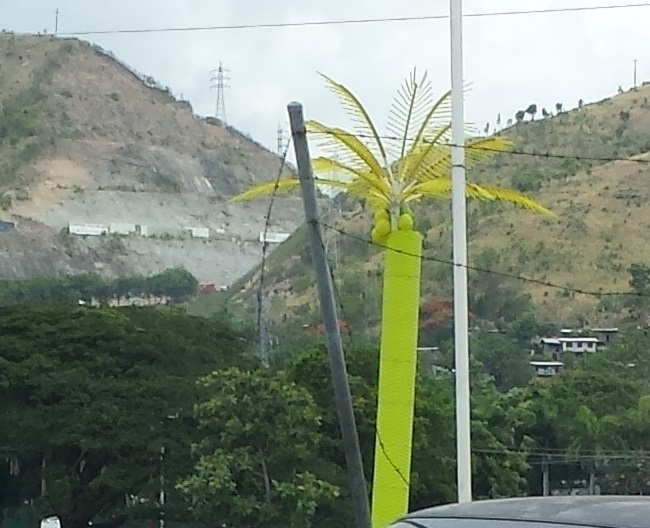 Someone woke up one morning and said, “What Port Moresby lacks most, in my opinion, is large, fake, colourful, lighted palm trees”. And they made it so. They are kind of pretty when lit up – in a gaudy, Chinatown kind of way. My first Port Moresby sunrise of the year did not disappoint. I felt good about returning. I enjoyed a wonderful break in Canada for Christmas where I was fighting through about 20cm of snow all over town for a while. I took advantage of it though and went snowboarding when I could. Returning to the sunshine in the Pacific was pleasant contrast. The preparations for the Pacific Games next year are progressing well. The work continues on the new stadium. I am delighted about this because the old one was becoming a slum and I was nearly mugged around there a couple of times last year. The construction has cleared out the people and now the area is much safer. Some other changes were instantly obvious. That building didn’t exist when I left. 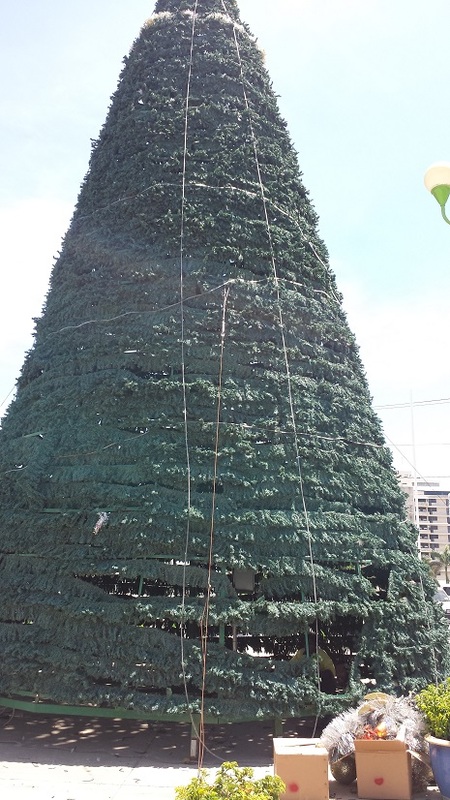 I guess someone worked overtime during the Christmas period. 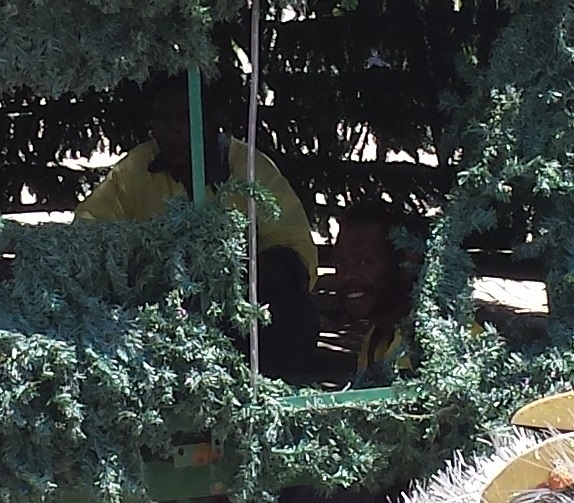 The Christmas trees that went up with such excitement in November are now being pulled down. The workers took refuge from the sun under its mighty, artificial bows. Of course, I had jetlag to deal with. 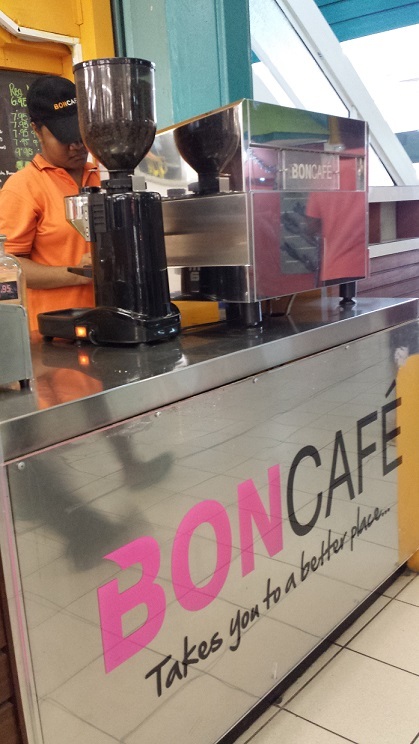 But the good people at “Bon Café” are always happy to help. They still remembered my order. But their coffee went up by about 15%. That’s inflation for you. 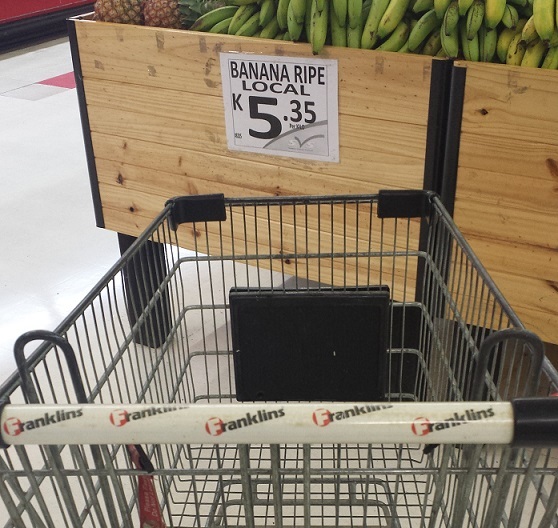 The kina continues to show weakness, forcing the price of everything that is imported. PNG makes good coffee, so it’s not imported but I expect that the owners of this chain are and they want to be paid in hard currency. I had used up all my food before I left so on the first day back I hit the supermarket. 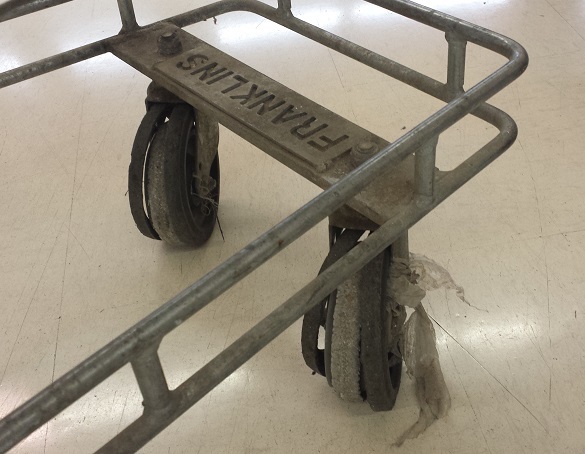 Another change that I observed was new trolleys (carts). The old ones had all had the handles broken off them, so one had to grab the metal sides and wrestle the trolley around the supermarket with those. The new ones are obviously recycled from the Australian chain “Franklins”. Of course they’re not in fantastic shape either, but they are definitely an upgrade. 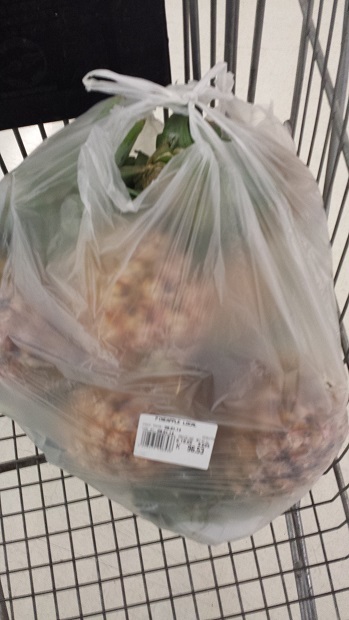 And high on my priority list was those glorious pineapples. I spent almost 100 kina on them. They are to die for. But lobster is one of the few things that are cheaper in PNG. 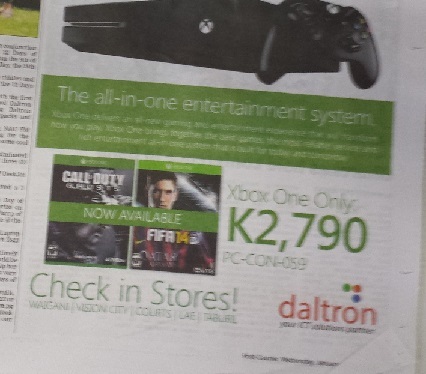 The X Box One, which sells in Canada for $500, is now for sale here for 2,790 kina – that’s US$1,140. So spare a thought for the poor children of PNG who will have to play outside and develop life skills instead. Back in the office, it’s business as usual and I have been extra busy due to the absence of other team members. It’s also been rather hot here – in the Southern Hemisphere’s summer. We’ve had 35-40 degree days on a regular basis, so the fans have been working overtime. Everything was much as it was when I left. Except the bathrooms. This is why management cancelled “Burrito Tuesdays”. 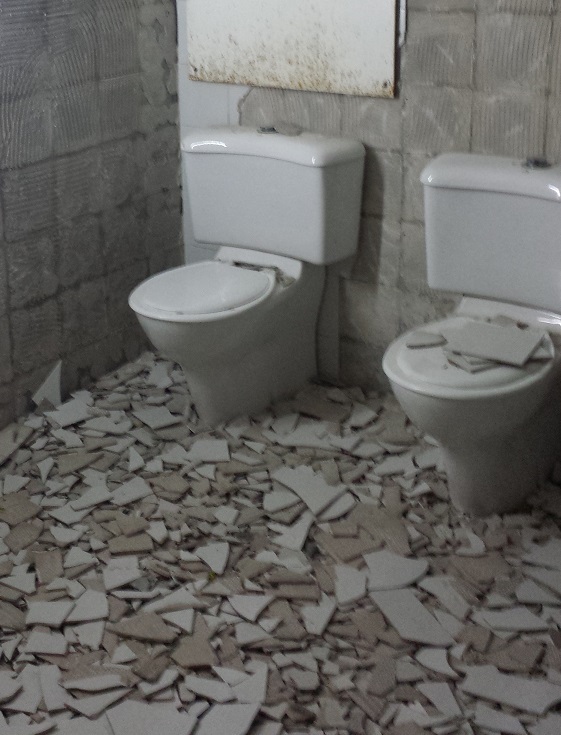 While the renovations are ongoing, every second bathroom is out of commission. Since they lock them up like Fort Knox to prevent unauthorised relieving of oneself, it’s harder than ever to find a bathroom when one is required. I’m forced to use the bathroom on the floor below. The locks on the stall doors don’t work so while one is busy in there one can sometimes suffer an attempted stall invasion. It’s most unpleasant. Speaking of the facilities. I visited my local car dealership for a service this week. Their bathroom doors have the same picture on them – one with the legs filled in. One would think these signs would come in pairs, but apparently the store ran out of the ladies’ version at some point. I’ve been enjoying walking more – particularly around the Yacht Club marina. 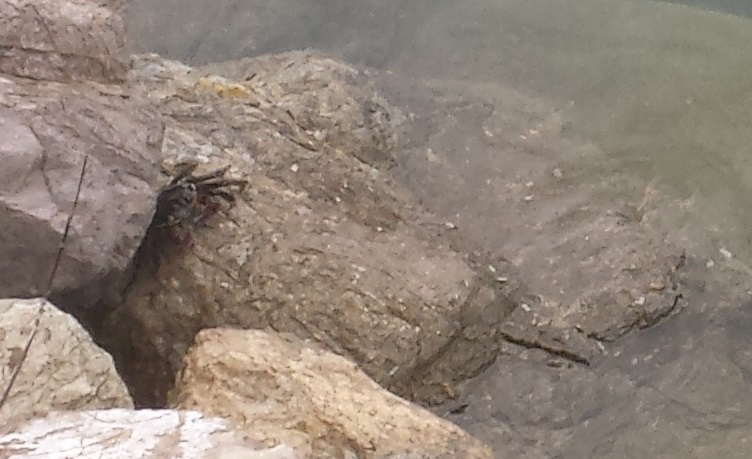 I spotted this crab there this week – about the size of one’s fist. There is a saying that “A week is a long time in politics”. That was especially true in the last week. 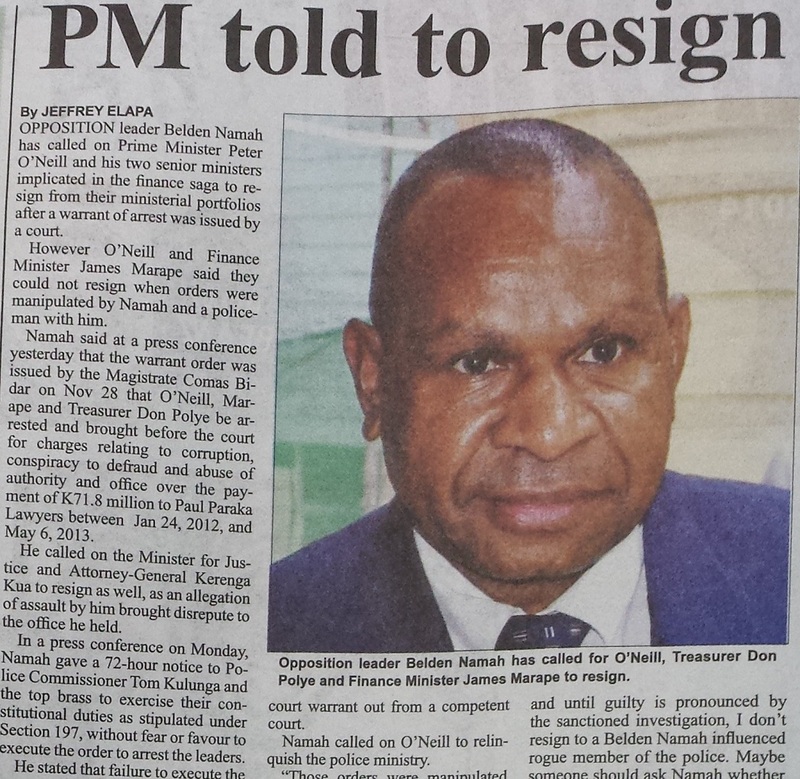 This is Opposition Leader Belden Namah. He created headlines by arranging for arrest warrants for the Prime Minister and a couple of his close allies in Government, alleging corruption. The two parties traded blows in the headlines for the following week. Initially, the PM denied the allegations and then launched an enquiry into what he dramatically labelled an attempt to overthrow the Government. 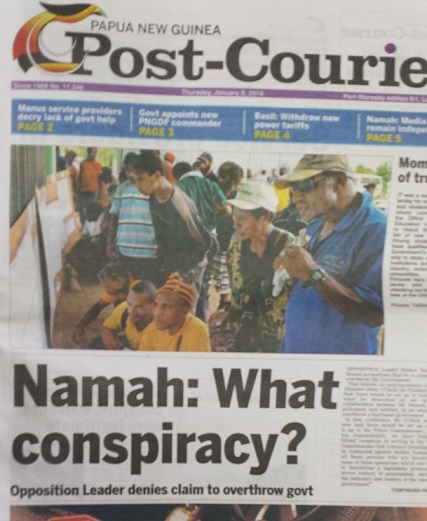 Namah responded by saying that there was no such conspiracy – that the warrants were legally obtained with the assistance of police officers and a judge. 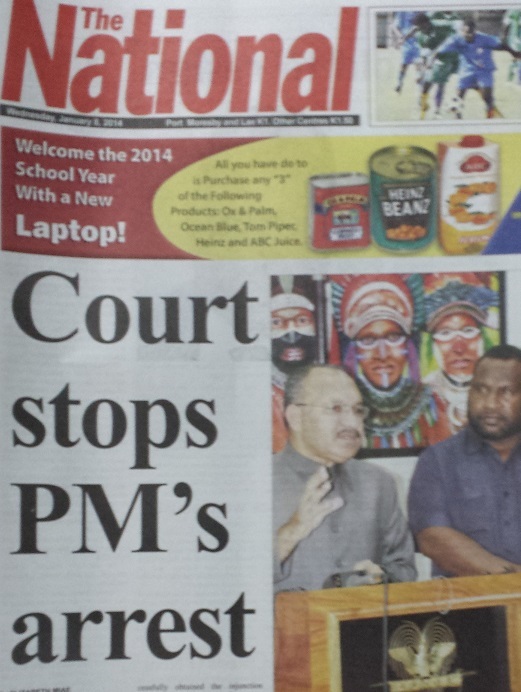 The matter was referred to a different court, which supported the Prime Minister and quashed the arrest orders. So the excitement has died down for now. However, the inquiry is ongoing and it is likely that there will be consequences for those involved in arranging the warrants. Tension between law enforcement and allegedly corrupt officials is not uncommon. 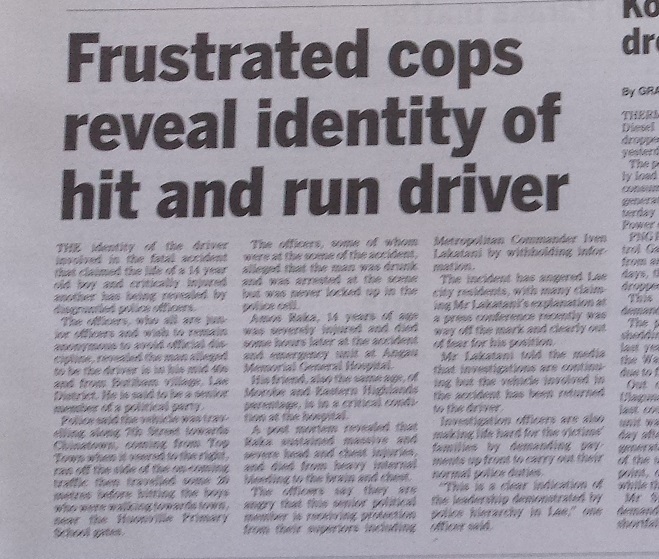 In this case from the city of Lae, some police officers personally witnessed a ‘hit and run’ by a drunk driver that resulted in the death of a 14 year old boy. The police arrested the driver but charges were never formally made as he was a prominent local politician. The officers were silenced but later decided to blow the whistle and reveal the details of the affair – including the name of the politician. Interestingly, said name did not appear in this news article. In a country with around 1300 distinct cultures, tribal conflict is both inevitable and unceasing. There are regular reports of deaths from clashes between rival groups. 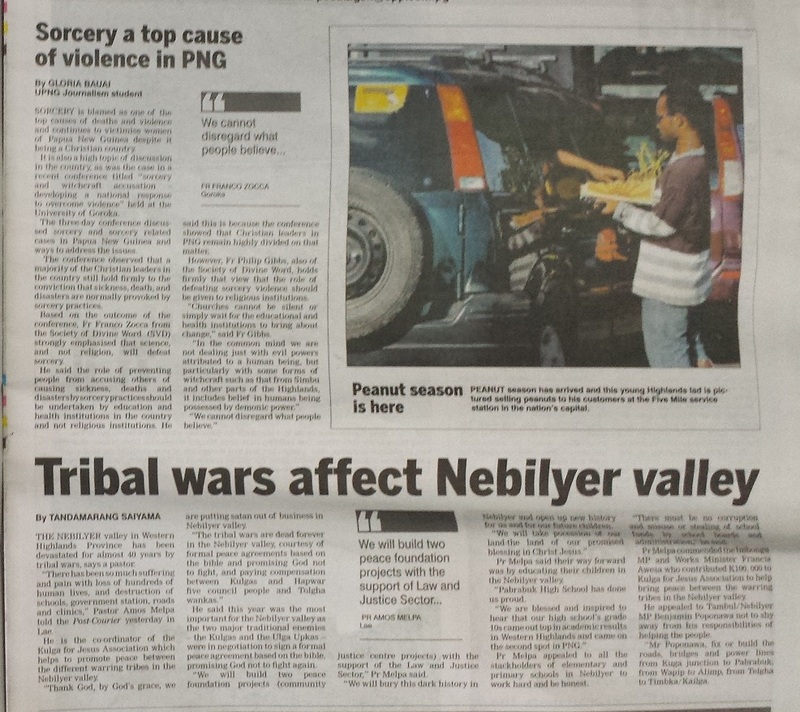 Also on this page, was a report on a 3-day conference at a PNG university on Sorcery. There is concerned about the violence associated with sorcery and apparently a 3-day conference was the answer. I wish I were joking. 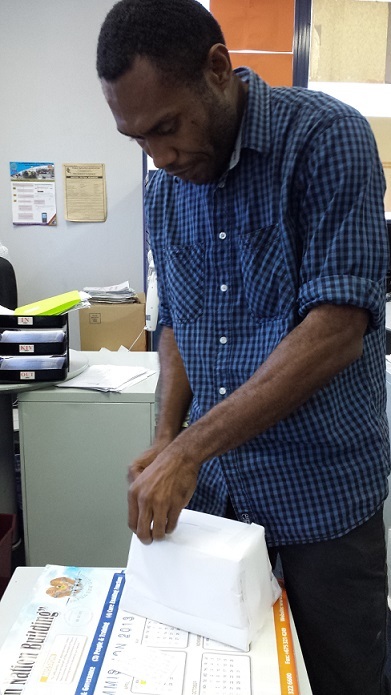 This week’s “Brush with death in PNG” came in the form of a viral infection and bad weather. On Friday night I came down with about 6 of the key symptoms of malaria – high fever, a temperature of 39.5 degrees Celsius, aching muscles all over my body, a headache and an upset stomach. I was in a bad way but with all of my colleagues away I had no one to drive me to the hospital. So I set off on my own trying to find a medical centre that I have never visited before. Despite some bad turns and me feeling like collapsing at the wheel, I made it to the hospital and was treated. Well, I say treated but I was not too confident of diagnosis. The doctor didn’t know how to pronounce the word ‘chest’. He kept saying, “Shesst”. 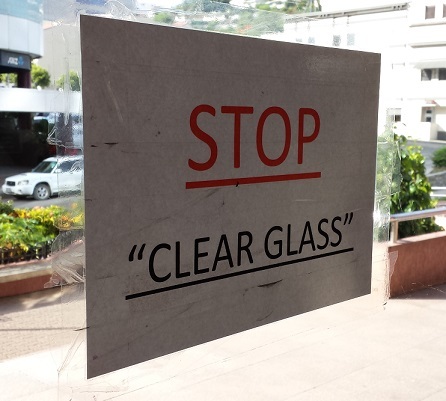 It took a few times before I worked out what he meant. Now, I don’t need a doctor to be able to speak well to know his stuff but this didn’t inspire confidence. The chest is kind of an important part of the body and I’m pretty sure that they would have covered that at some point in medical school. Nevertheless, the chap did his best and administered some blood tests. Negative for malaria and Dengue, which is great news. But he didn’t know what the problem was. He sent me to bed with some Panadol and suggested that I come back in the morning. I walked outside to find that it had started raining. Well more of a torrential downpour. The word ‘rain’ doesn’t really describe it adequately. 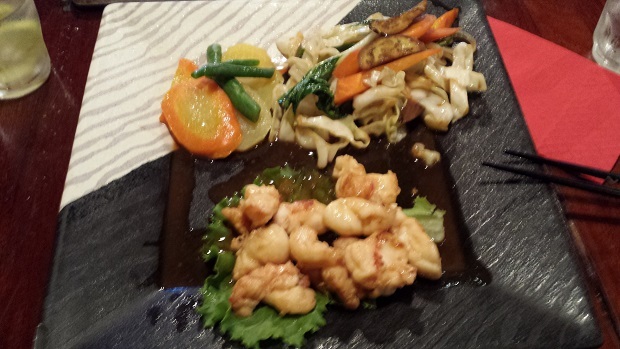 The visit to the hospital took two hours and left me feeling weaker than when I had arrived. So now I faced the prospect of driving myself home through an unfamiliar neighbourhood but with the added bonus of driving through the rain. It was worse than I could have imagined. The water was pooling all over the place and everywhere I drove, I hit puddles up to half a metre in depth (that’s almost two feet for my Luddite readers). I had just had the car serviced and they told me that the brakes need fixing but that they didn’t have the parts. The service had also left the ‘check engine’ light on. 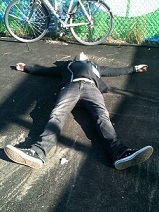 So as I drove along in my weakened state, my stress levels began to build. To make matters worse, at every intersection there were people (usually young men) hanging around in the rain. 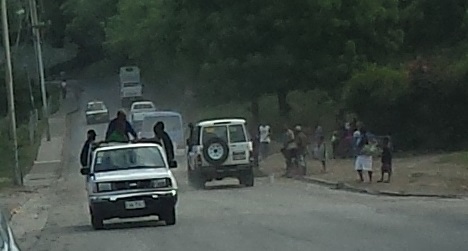 That is a standard car-jacking technique – to wait in areas where people are forced to slow down and then pounce. So I was doing my best not to slow down, but needing to at times to navigate the huge puddles. I was freaking out that I was going to hit a big one that would disable the engine and then I’d be trapped. A huge about of debris was washing onto the roads at the same time, playing havoc with the car’s traction. 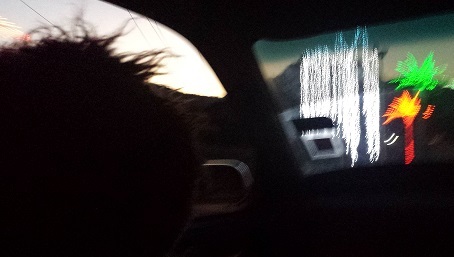 So it was close to the worst driving conditions imaginable. But I made it home. I kept my head and my concentration long enough to get home and collapse into bed. I stayed there for two whole days eating nothing but a can of Campbell’s soup (Cream of Chicken – I recommend it). I saw a different doctor on Saturday and had another check-up yesterday. They confirmed that it is just a viral infection and that it will pass. I’m feeling a lot better now, but it will take me a few more days to get back to full strength. One interesting consequence of the debris washing on to the road is that groups like the one pictured above organise themselves into clean-up teams. They bring along makeshift tools and cart away the rubbish and rocks that have washed on to the road. They usually have a cardboard box into which donations from the passing drivers are placed. Sometimes they can be quite intimidating towards drivers and most seem to contribute at least a few coins. It’s essentially a privatised road repair crew with a user-pays funding system. I was intrigued because I generally see limited evidence of entrepreneurial enterprise nor community spirit around here. Much more often it is people brazenly discarding coke bottles out of car windows. However, in this case people show surprising initiative and organise a clean far more efficiently and rapidly than any government could. This really is a land of surprises. Mosquito-born diseases are so prevalent here that at the medical centres they often send people away with anti-malarials without even testing for the disease. Given that my symptoms were so similar, that could easily have happened to me, however I insisted on the test. 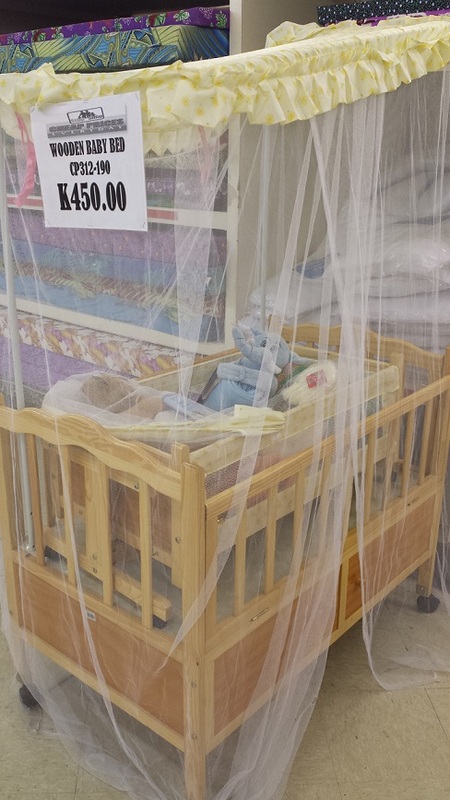 To avoid infants contracting such diseases, they sell these cute cots that come with their own mosquito net. Now for some random weird stuff that I’ve seen around town, let’s start with Pig Bins. These bright pink bins (called ‘skips’ in the U.K.) are seen around town – usually at building sites. A special truck comes and picks them up and takes away the rubbish. This is one of the more creative shop displays that I have seen here. 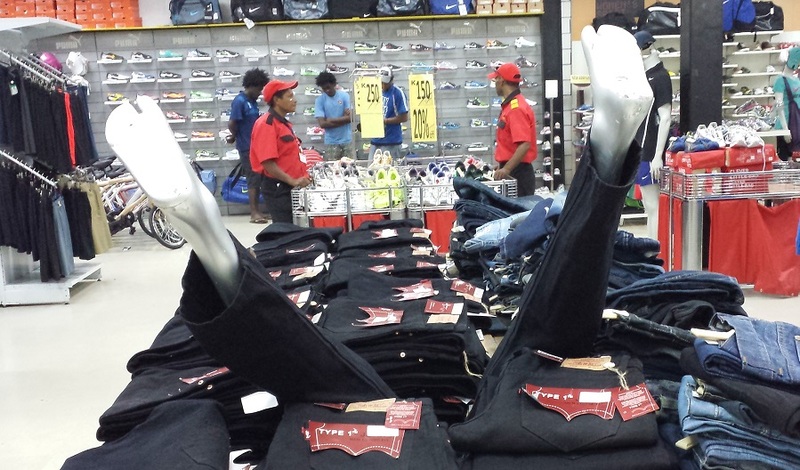 I am sure it has been good for sales of fake Levi’s imported from Asia. Some bean counting Einstein came up with this idea – an aluminium can made mostly out of plastic. 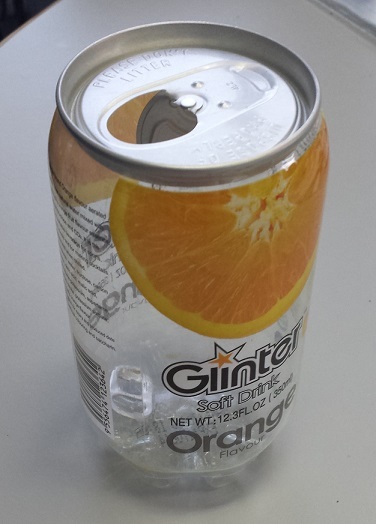 So now it’s harder to recycle but saves the vendor $0.0001 per can in production costs. No doubt they’ll be everywhere by June. Inspired marketing right here – create a nappy (diaper) company and call it “Bumbums”. 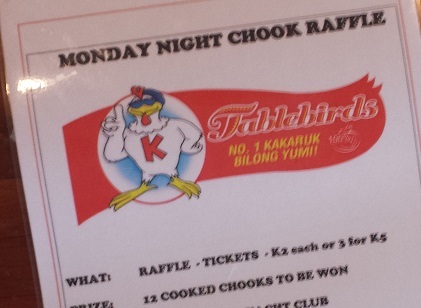 One knows that Australians are in charge when a club offers a “Monday Night Chook Raffle”. Who could resist the lure of “12 Cooked Chooks”? My personal favourite for this week was this packaging for a container that I bought. I needed something in which to keep loose items on my desk. 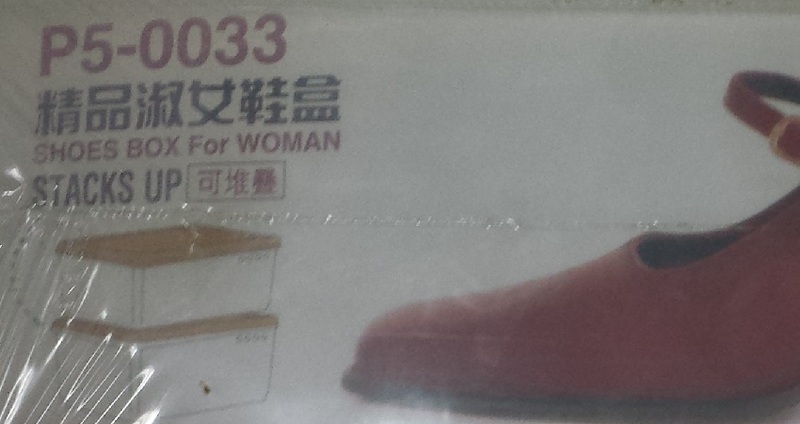 But the manufacturer conceived this container as a “Shoes box for woman”. I didn’t care and just put whatever I wanted in there. I’m such a rebel. This is Lincoln. He’s a big fan of J.R.R. Tolkien and the Lord of the Rings. We were discussing it one day and he mentioned that he wants to read “The Hobbit” but he can’t find a copy of it. There are not many book stores in town, and often the only books that are available are those that are in the second hand shops. They are supplied by charities in Australia usually, so they tend to be old and uninteresting books that have been discarded. When I heard Lincoln’s lament about a lack of a classic piece of literature, I decided to pick him up a copy when I was back home. 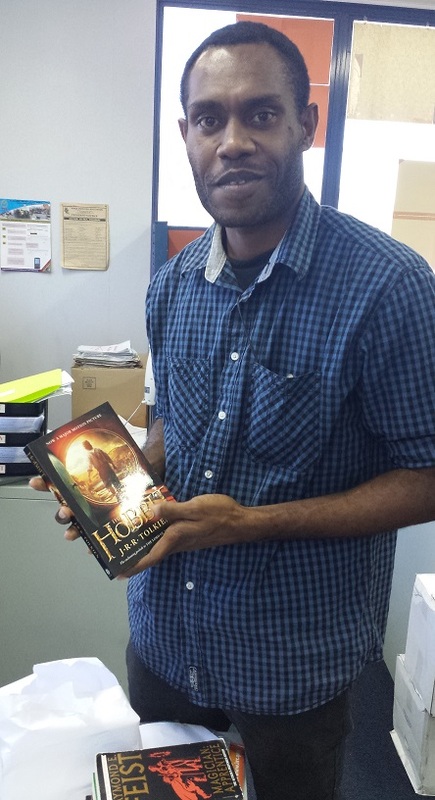 I also gave him a series of books by Raymond E. Feist – another of my favourite authors in the Sci-Fi Fantasy genre. Lincoln was delighted with the gift. In fact, he said that it was the only thing that he received for Christmas. He started reading “The Hobbit” right away and he has been briefing me on his progress (the Dwarves just reached the Lonely Mountain). Lincoln is a very intelligent chap who is just about to commence medical studies to become a doctor. I am sure that he will do very well. PNG needs more like him. Whatever event necessitated erecting this sign probably caused someone to have a very bad day. Thanks Di. I’ll be passing through Brisbane on the 13th of next month. If you’re availabale maybe we could have dinner.